This episode takes us on a treasure hunt to the beautiful state of <?xml:namespace prefix = st1 ns = "urn:schemas-microsoft-com:office:smarttags" />Oregon to visit with Brian Jacob Conifer Inventory Specialist for Monrovia Growers. We get a tour of the over 6oo acres of Growing Fields and many acres of Trial Gardens. Then off to Schreiner’s Iris Gardens to see the top breeder of bearded irises in the country and their beautiful gardens as well. This episode of Garden Wise with Arlena is honored to have guest host Steve Schott of Mr. Grill as we call him show you how easy and fun ,not to mention deliciouse it is to Brew your own beer with a kit from MR. BEER. Along with Beer goes BBQ and Steve treats us to a mouth watering Rib Eye steak togeother they are a perfect match. Video coming soon. Garden Wise Finishes a Sod Project in Independence Wisconsin and then Heads out for a treasure hunt to Jirik Sod Farm of Farmington Minnesota for some History of the Family owned Business and great tips from the experts..
Garden Wise Finishes a Sod Project in Independence Wisconsin and then Heads out for a treasure hunt to Jirik Sod Farm in Farmington Minnesota for some History of the Family owned Business and great tips from the experts..
Spring is a great time to lay Sod. Not only is the temperature cool for working but cooler weather allows the Sod to get growing before the heat really sets in. Laying Sod in the spring you will use less water than in the summer to get the Sod growing. Laying Sod can some times be a little intimidating but if you follow these easy steps you will have a Green Lawn in now time. Work up the area you want to lay your sod, remove any debris, old grass, weeds, rocks or clumps, leveling the area as you go. If laying down hill run your sod across to keep from forming wash out water ways. Start lying at the straightest side of your sod laying area. Stager your Rolls like a Checkerboard patter to detour water ways and a tighter sod bed. 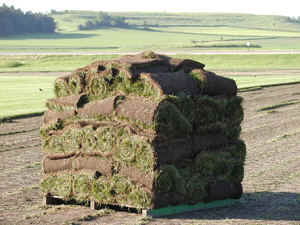 Lay your sod rolls down and then scoot them up next to the other pieces making sure not to over lap the seams. This makes your seems grow strong together. Follow the edge of the planting beds with a trim of the sod with a utility knife. Patch in pieces for the checker board. 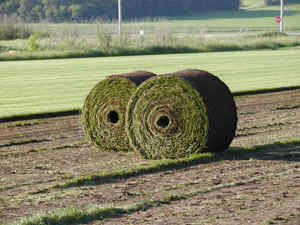 Lightly Roll the sod to insure a tighter seem growth. If you do not have a roller you can rent one at most hardware stores. WATER! WATER !WATER !………..keeping in mind Roots will NOT grow into dry soil. STAY OFF the sod until it is good and rooted. Don’t mow for at least 2 weeks. Then mow at the highest settings of the mower. Fertilize in the Fall if planting in the Spring, Fertilize in the Spring and Fall if planting in the Fall. For more information on how to plant a beautiful sod lawn. Watch Garden Wise with Arlena’s ‘Jirik Sod Farm “feature on the stations listed. or log on to www.jiriksod.com for more ideas and ordering information. "On The Ice in Wisconsin"
.Even as late as March Wisconsin can have snow. This doesn’t stop Arlena and her family from enjoying a Day on the Ice. We get some great tips from some seasoned ice fisherman and enjoy the sunshine of the late winter day here in Wisconsin. We saw a lot of new trends for the season, including Warm Tones in Containers to Pizzazz in Watering Cans. 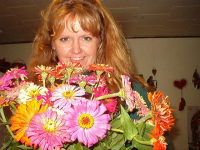 Arlena has a blast as she travels around the area to see what the holidays has for Garden Wise. First stop is at Alternative Ground in Whitehall WI were Bill makes a warm holiday Latte.Then stopping off at Gaetjes Green House in Hixton WI to paint poinsettias, next wandering through Whitehall WI Arlena gets some Holiday safety tips from Millers Hardware and last but not least Arlena enjoys watching Carol and Karen make their Holiday Tradition. Arlena prepares 3 of her favorite fall dishes for the Garden Wise viewers. Roasted Vegetables served in a pumpkin Bowl, Agave Squash Pie and a Raw Pumpkin Pie that is sure to be the hit at any Thanksgiving Table. Fall Favorites is a collection of some of Arlena’s favorite things. Arlena takes the viewers through the process of planting a Fall Greeting for your doorstep at one of Bachman’s Garden Centers in Minnesota and then jumps in a car and heads to Duluth Minnesota to smell the aromas of fall with the perfect cup at Alacef Coffee Roasters. Finally stopping at Cedar Grove Orchard to pick the perfect Honey Crisp Apple.